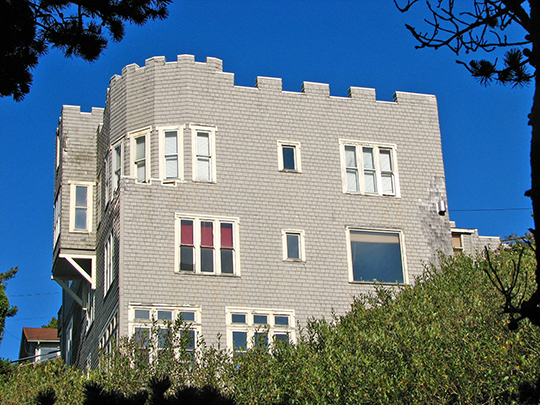 Newport City Hall is located at 169 SW Coast Highway, Newport, OR 97365; phone: 541-574-0603. Photo: Charles and Theresa Roper House (Hilan Castle), ca. 1913, 620 SW Alder Street, Newport, OR. Listed on the National Register of Historic Places in 1981. Photographed by User:Werewombat (own work), 2008, [cc-by-3.0 (creativecommons.org/licenses/by/3.0)], via Wikimedia Commons, accessed January, 2014. Incorporated in 1882, Newport was then a part of Benton County. Lincoln County was established in 1893 from land including the Siletz Indian Reservation as well as parts of Benton and Polk counties. The first settler in the area is believed to have been one Captain Spencer who, traveling with an Indian guide, discovered oyster beds on Yaquina Bay, about 4 miles east of what is now Newport. Newport spreads across a blunt ridged peninsula between the ocean and Yaquina Bay. Though the first settler arrived in 1855 it was several years before there was a village here. Traders and fishermen were the first arrivals. Then the people of the Willamette Valley discovered it to be a delightful resort area and the Ocean House, built in 1866, and the Abbey House and Fountain House, opened in 1871 all facing the bay began to draw visitors who would take the five-day coastal voyage to San Francisco as a diversion. Others engaged in the clam-digging and crabbing that still attract many. This section remains the commercial center of town, which flourished in the 1890s when Yaquina Bay ships carried away the products brought across the range from the Willamette Valley on the old Oregon Pacific Railroad. Newport is now primarily a resort with a somewhat Victorian appearance in the older areas. Shell-fishing gives it some commercial importance. Crabs, clams, and oysters the latter artificially planted to renew the supply are shipped inland. Oystering is done in flat-bottomed boats with the aid of long-handled tongs. The view of the bay at sunset, when the fishing fleet rides at anchor, is particularly attractive. This bay is also the anchorage for the deep-sea fishing boats that carry visitors across the bar to fish and to watch for the porpoises, sea lions, and whales occasionally seen offshore. Visitors also hope that careful search may one day discover four valuable diamonds that were thrown into the waters in 1915. A Portland resident who died in that year stipulated in his will that these stones, which had belonged to his mother, should be thrown into the water to keep them forever from others. John Fleming Wilson (1877-1922), the author of numerous books lived here for about three years after his marriage in 1907. Mariner, school teacher, and newspaper reporter, he was able to leave $90,000 earned by writing stories and novels, some of which were based on material gathered in the Yaquina Bay district.